We’re all familiar with thought, to be sure, just like we’re familiar with our own bodies. But just because we know our own bodies doesn’t make us all doctors. In the same way, we might know our own thoughts well, but that doesn’t make us experts in the science of thought. But understanding thought is important. If we don’t know what thoughts are, then it’s very easy to be conned into believing the myriad of myths about thought perpetuated about them by every pop-psychologist and B-grade life coach. This series of blogs is taken from my book Hold That Thought: Reappraising the work of Dr Caroline Leaf. We’ve looked at some basic neurobiology, and today we’ll look at the neurobiology of thought itself. Later we’ll discuss some psychological models of our thought processing, and finally we’ll discuss the common brain states and functions that are usually confused with thought. Building on Baddeley’s model of working memory, Baars proposed the Global Workspace theory , and Baars and Franklin went further by adding the Intelligent Distribution Agent model . Central to this model is the “Cognitive cycle”, a nine-step description of the underlying process from perception through to action. In the model, implicit neural information processing is considered to be a continuing stream of cognitive cycles, overlapping so they act in parallel. The conscious broadcast of our thought stream is limited to a single cognitive cycle at any given instant, so while these thought cycles run in in parallel, our awareness of them is in the serial, sometimes disparate, streams of words or pictures in our minds. Baars and Franklin suggests that as many as ten cycles could be running per second , and since working-memory tasks occur on the order of seconds, several cognitive cycles may be needed for any given working memory task, especially if it has conscious components such as mental rehearsal . Franklin et al summarise the process, “During each cognitive cycle the LIDA agent first makes sense of its current situation as best as it can by updating its representation of its current situation, both external and internal. By a competitive process, as specified by Global Workspace Theory, it then decides what portion of the represented situation is the most salient, the most in need of attention. 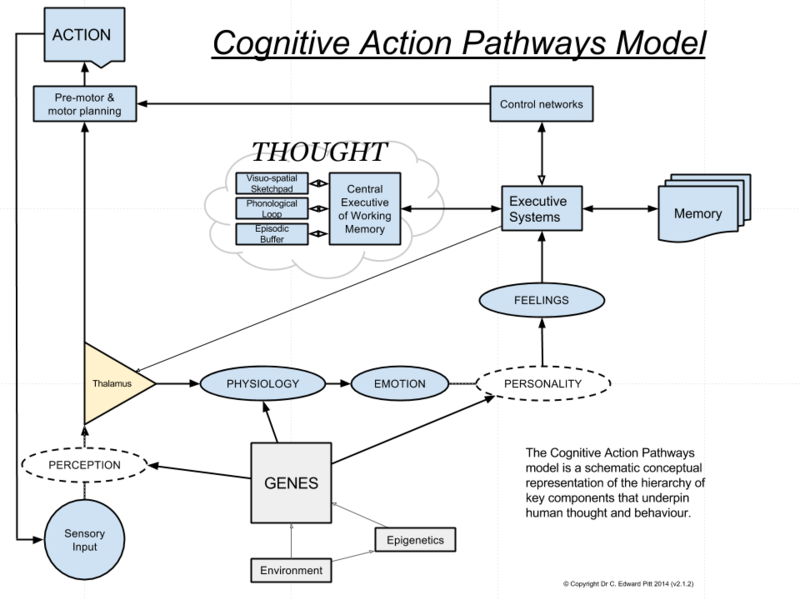 Broadcasting this portion, the current contents of consciousness, enables the agent to chose an appropriate action and execute it, completing the cycle.”  Information within the cognitive cycle is broadcast to our consciousness in order to recruit a wider area of the brain to enhance the processing of that information [2, 5]. It’s the broadcasting of this portion of the information flow that renders it “conscious”. Neural networks involved in the neurobiology of thought? There is good evidence that working memory, and the attention required to select the information streams that fill the global workspace at any one moment, are intrinsically linked to a group of brain regions tagged as the Prefrontal Parietal Network . Disease or damage to the PPN or impairment of the PPN in the lab impairs normal conscious function. Research-level brain imaging studies have strongly implicated the PPN in perceptual transitions, the conscious detection of stimuli in a range of modalities, sustaining percepts, and in metacognitive decisions (awareness of awareness) on those percepts. Finally, a reduction of conscious level when under general anesthesia is associated with a reduced lateral prefrontal activity . Other neural networks have been defined that are also important in the neurophysiology of conscious awareness. When there are no external stimuli, the brain doesn’t just turn off. Some parts of the brain become even more active. The same parts of the brain are active when we daydream (what researchers call “stimulus independent thought”). We have all experienced this at some point. Our body will be doing something while our brain is off somewhere else. I find this happens to me when I’m driving home from work. Going the same route every day means that I often drift into autopilot as I’m thinking about the events of the day or my stomach reminds me that I’m hungry, and five minutes later I pay attention to my surroundings and realise that I’m nearly home. There are many other sentinel neurocognitive networks, among them: the default mode network, the central executive network, and the salience network. The central executive network is involved in actively working on an external task, which we think of as attention. The default mode network is involved in autobiographical retrieval and self-monitoring activity, the “stimulus independent thought”, or day-dreaming. The salience network acts as a switch between the two, figuring out which external stimuli need active attention and switching on the central executive network . Whichever one of these networks is active at the time, that network is actively feeding information into the working memory, which is what we perceive as “thought”. When the brain is engaged in a new or difficult task requiring active attention, the executive parts of the brain overtake the default mode network. But when attention is not actively required such as well-practiced tasks, or if our attention diminishes as with boring tasks, the Default Mode Network becomes dominant again. The switch between attention and the default mode network is strongly related to the neurotransmitter dopamine . These networks heavily overlap with the Prefrontal Parietal Network and the global workspace model. Recent neurobiological evidence confirms the role the default mode network in thought processing, specifically the part of the brain called the cingulate cortex. This has been confirmed in studies in healthy subjects , and in people with formal thought disorders (especially auditory verbal hallucinations) . Specifically, the DMN is often the part of the brain that is the most active in remembering the past, and using similar mechanisms, also the simulations of the future. It is linked to daydreaming and creativity especially when a problem is allowed to “incubate” for a while, while the brain is involved in another task that is more menial, or low stress. It’s theorised that the attentional and implicit networks in the brain are brought into a closer proximity and allowed to interact, which improved the likelihood that a novel solution would be discovered . Research into the topics of thought and consciousness is ever-growing and expanding, and if you want to read more about these topic, they have been very well covered in a two part series from De Sousa,  and . Lutterveld, R.v., et al., Network analysis of auditory hallucinations in nonpsychotic individuals, in Auditory verbal hallucinations and the brain, Lutterveld, R.v., (Ed). 2013, University Medical Center Utrecht: The Netherlands. p. 117-37. But understanding thought is important. If we don’t know what thoughts are, then it’s very easy to be conned into believing the myriad of myths about thought perpetuated about them by every pop-psychologist and B-grade life coach. This series of blogs is taken from my book Hold That Thought: Reappraising the work of Dr Caroline Leaf. We will look at some basic neurobiology first, then look at the neurobiology of thought itself. We’ll discuss some psychological models of our thought processing, and finally we’ll discuss the common brain states and functions that are usually confused with thought. At the most fundamental level of our thought process is the nerve cell, also called a neuron. Nerve cells, like all cells in the body, have a nucleus containing the genetic material. The nucleus is surrounded by cytoplasm, a watery chemical soup that contains the functional proteins that make the cell run. A thin lipid layer called the cell membrane envelopes the nucleus and cytoplasm. The cell membrane contains important protein structures such as receptors that help the cell receive signals from other cells, and ion channels, which help the cell regulate its internal chemistry. Compared to other cells, nerve cells have three unique structures that help them do their job. First are dendrites, which are spiny branches that protrude from the main cell body, which receive the signals from other nerve cells. Leading away from the cell body is a long thin tube called an axon which helps carry electrical signal from the dendrites, down to the some tentacle-like processes that end in little pods. These pods, called the terminal buttons of the axon, and then convey the electrical signal to another nerve cell by directing a burst of chemicals towards the dendrites of the next nerve cell in the chain. There are a number of different chemicals that traverse synapses, but each terminal button has its own particular one. The most well known are serotonin, noradrenaline and dopamine. If the signal from the first nerve is strong enough, then a critical amount of the chemical is released and will make it across the gap to the dendrites of the second nerve cell on the other side. The chemical interacts with specific receptors on the new dendrites, which cause them to open up to certain salts like sodium and potassium. As sodium and potassium move in and out of the cell, a new electrical current if formed in the second nerve cell, passing the signal down the line. To prevent the chemicals in the synapse from over-stimulating the second nerve cell, enzymes breakdown the chemicals to clear the space before the next signal comes past. What gives the nervous system and brain the near-infinite flexibility, and air of mystery, is that there are eighty-six billion nerve cells in the average adult (male) brain. Each nerve cell has hundreds to thousands of synapses. It’s estimated that there are about 0.15 quadrillion (that’s 150,000,000,000,000) synapses throughout the average brain . And that’s not including the nerve cells and synapses in the spinal cord, autonomic nervous system and throughout the body. Each of these cells and synapses connect in multiple directions and levels, and transmit signals through the sum of the exciting or inhibiting influences they receive from, and pass on to, other nerve cells. Single nerve cells may have the appearances of trees with their axon trunks and dendritic branches. But altogether, the billions of connections would more resemble a box of cobwebs. But unlike a box of cobwebs, the brain has precise organisation to the myriad of connections. These areas can be defined either by their structure, or by their function. Structurally, there are areas in the brain that are dominated by nerve cell bodies, formed into a little cluster, called a nucleus (different from the nucleus of each cell). Then there are groups of axons bundled together, called a tract, which behave like a data cable for your computer. Nuclei process multiple sources of signal and refine them. The refined signals are sent into the appropriate tract to be transmitted to either another set of nuclei for further refinement, or to distant structures to carry out their effect. The axons of the nerve cells that make up the tracts are usually covered in a thick white material called myelin. Myelin acts like insulation on a wire, improving the speed and accuracy of the communicated signal. Parts of the brains with lots of myelinated cells are described as “white matter”. The nuclei and the cerebral cortex (the outer covering of the brain) are unmyelinated cells, and are referred to as “grey matter”. On a functional level, the brain is divided into parts depending on what information is processed, and how it gets processed. For example, the cerebral cortex is divided into primary areas for the senses and for motor functions, secondary areas and tertiary association areas. The primary sensory areas detect specific sensations, whereas the secondary areas make sense out of the signals in the primary areas. Association areas receive and analyze signals simultaneously from multiple regions of both the motor and sensory areas, as well as from the deeper parts of the brain . The frontal lobe, and specifically pre-frontal cortex, is responsible for higher brain functions such as working memory, planning, decision making, executive attention and inhibitory control . Everything our senses detect is essentially deconstructed, processed then reconstructed by our brains. For example, when reading this page, the image is decoded by our retina and sent through a number of pathways to finally reach the primary visual cortex at the back of our brain. The primary visual cortex has 6 layers of nerve cells which simultaneously encode the various aspects of the image (especially colour, intensity and movement of the signals) and this information is sent to the secondary association areas that detect patterns, both basic (lines are straight, curved, angled) and complex (two diagonal intersecting lines form an ‘x’). One part of the secondary association areas in the visual cortex (the Angular Gyrus) processes these patterns further into the patterns of written words. The information on the various patterns that were discerned by the secondary association areas then get sent to the tertiary association area for the senses where those visual patterns are combined with patterns processed from other sensory areas (hearing, touch and internal body sensations) to form a complex pattern of multimodal association . In the case of reading, the tertiary association area allows comprehension of the written words that were previously only recognised as words by the secondary association areas. Emotions are a difficult concept to define. Despite being studied as a concept for more than a century, the definition of what constitutes an emotion remains elusive. Some academics and researchers believe that the term is so ambiguous that it’s useless to science and should be discarded . I’ll discuss emotions further in chapter 2, but for now, it’s easiest to think of our emotional state as the sum total of our different physiological systems, and feelings are the awareness, or the perception of our emotional state. Different parts of the brain are responsible for the awareness of these feelings. The amygdala is often considered the seat of our fears, the anterior insula is responsible for the feeling of disgust, and the orbitofrontal and anterior cingulate cortex are involved in a broad range of different emotions . Different emotional states are linked with different neurotransmitters within the brain. For example, a predisposition to anxiety is often linked to variations in the genes for serotonin transport  while positive and negative affect (“joy / sadness”) are linked to the dopaminergic system . Memories, like thoughts, are something that we’re all familiar with in our own way. Memory is quite complicated. For a start, there’s more than one form of memory. You’ve probably heard of short term and long term memory. Short term memory is further thought of as sensory memory and working memory. Long term memory is divided into semantic and episodic memory. Memory is also classified as either declarative memory, also called explicit memory, and nondeclarative memory, also called implicit memory. Working memory is known to be distinct from other longer term memories that are dependent on part of the brain called the hippocampus, because patients with severe damage to the hippocampus can remember a small amount of information for a short time, but are not able to push that information into longer term memory functions to retain that information. Information in working memory doesn’t last for any more than a few minutes . So, there are many forms of memory that are important to our lives and influence our behaviour that are “inaccessible to conscious recollection”. But even declarative memory, which is accessible to thought, doesn’t actually make up the thought itself. Memories are stored representations. When memories are formed or retrieved, the information is processed in chunks. As Byrne pointed out, “We like to think that memory is similar to taking a photograph and placing that photograph into a filing cabinet drawer to be withdrawn later (recalled) as the ‘memory’ exactly the way it was placed there originally (stored). But memory is more like taking a picture and tearing it up into small pieces and putting the pieces in different drawers. The memory is then recalled by reconstructing the memory from the individual fragments of the memory.”  Recalling the original memory is an inaccurate process, because sometimes these pieces of the memory are lost, faded or mixed up with another . This is why what we perceive and what we recall are often two different things entirely. The idea that humans have an immaterial soul, separate to the body, has spanned history and culture. This idea is known as dualism. The concept of the spirit is fundamental to the Christian church. Christians are usually taught that humans are a spirit, having a soul and living in a body (the Triune Being Hypothesis). The concept permeates the work of Dr Caroline Leaf, forming the basis for her assumptions that our minds can control matter. However, the Bible does not state that the spirit and soul are separate to the body, only that they are linked in the earthly and supernatural realms. Over the last few decades, cognitive neuroscience has demonstrated that definable neural networks within the human brain mediate the components of the traditional soul. Religious belief and spiritual experiences are also heavily reliant on the human brain. These findings, along with a number of other philosophical objections, prove that dualism is not compatible with science or philosophy. Dr Leaf’s reliance on the concept of dualism creates an intellectual dissonance between her teaching and neuroscience. The notion that the soul and the spirit are separate to the body is also incorrect. However, quantum physics, and String Theory in particular, suggest that other dimensions and other universes exist, which may provide a scientifically plausible explanation of both natural and supernatural realms. It may be that our earthly body houses our natural spirit and soul within the brain, but that these are translocated to the celestial realm upon death. The challenge for the Christian church now is to unite the evidence of cognitive neuroscience with the description of the spirit, soul and body from scripture and further delineate the doctrine of humans as triune beings. It sounds a bit like the age-old chicken and the egg conundrum. In Ancient Greece, Plato proposed that human beings have an immaterial soul distinct from the material body while Descartes reinvigorated the idea in the 17th century. But the idea of the distinct immaterial soul is also found throughout different religions, and seems to be interwoven through the Bible as well. 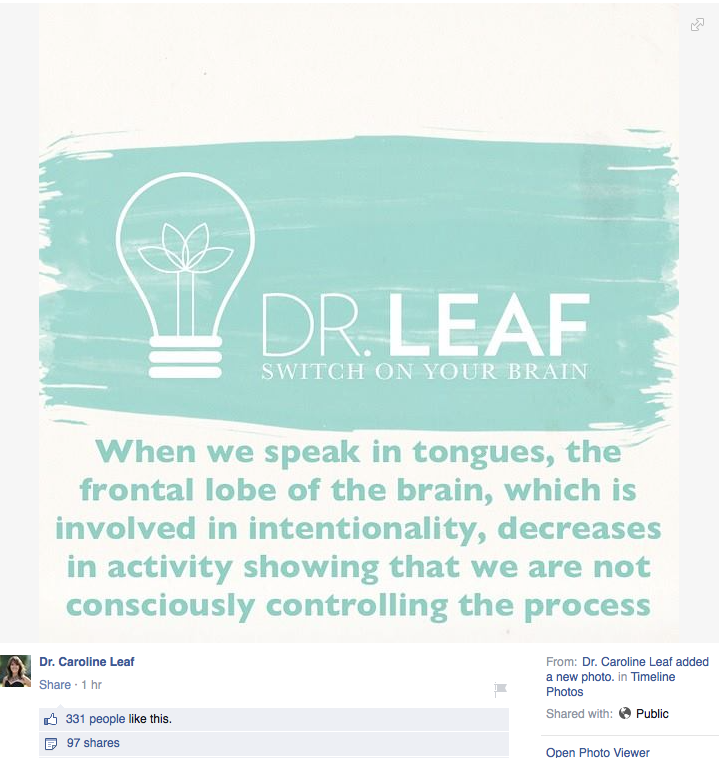 I have previously blogged about the scriptural and scientific voracity of Dr Leaf’s various statements on the Mind-Body problem (see also “Dr Caroline Leaf and the Myth of the Blameless Brain“, and others). But when she published, “Your mind will adjust your body’s biology and behaviour to fit with your beliefs” (21/6/2014) I thought enough was enough. The concept of dualism not only permeates the teachings of Dr Leaf, but also significantly influences the current understanding of the Biblical principles of the soul and spirit. So, this topic deserves an in-depth review, to ensure that the thinking within the church aligns with both scripture and science. By virtue of growing up in a Christian family, going to a Christian school, and digesting thousands of sermons during my lifetime, I’m very familiar with the concept of humans as a triune being (“triune”, meaning “three in one”). The concept I’ve been taught is similar to Dr Leaf’s view: that humans consist of three separate but interlinked components, the ethereal spirit and soul, and the physical body. The soul, in turn, consists of the mind, will and emotions. The three-part design reflects the image of God who is, of course, a triune being (the Holy Trinity: Father, Son and Holy Spirit). The hypothesis proposes that the body is just an earthly dwelling for a being that is fundamentally spirit in nature, the soul being the intermediary between the two. In keeping with the theme, this essay will be in three parts! First, I review the Biblical evidence relating to the body, soul and spirit. Second, I review the scientific evidence relating to the spirit and soul. And finally, I discuss how the scriptural and scientific evidence relates to our current understanding of dualism, the triune being hypothesis and the implications for Dr Leaf and Christianity more broadly. One of the fundamental arguments used by those who support the idea of man as a triune being is the way the Apostle Paul used distinct words to describe body, soul and spirit within the same sentence. For example, in 1 Thessalonians 5:23, Paul wrote, “And the very God of peace sanctify you wholly; and I pray God your whole spirit and soul and body be preserved blameless unto the coming of our Lord Jesus Christ” (emphasis added). The three words used in ancient Greek were pneuma (‘spirit’), psyche (‘soul’) and soma (‘body’). According to Thayer’s Greek Lexicon, the words pneuma (‘spirit’) and psyche (‘soul’) were often used indiscriminately. So although the Apostle Paul distinctly used the word pneuma separately to the word psyche as in 1 Thessalonians 5:23, most of the other New Testament writers weren’t so precise. James wrote that without the spirit (pneuma), the body (soma) would die (James 2:26). This also suggests that the spirit is different to the body, but still integral to the whole person, although given the interchangeable use of the terms, James may have also been referring to the soul. However, Jesus told the disciples in Matthew 10:28, “And fear not them which kill the body (soma), but are not able to kill the soul (psyche): but rather fear him which is able to destroy both soul (psyche) and body (soma) in hell.” This suggests that both the soul and the body maybe found in hell, a post-death spiritual dimension (see also Luke 12:5). So it seems that at least in some form, our supernatural selves also possess a body and mind. This idea seems to have some backing in the form of the description given in the Bible of the resurrected body of Jesus. After Jesus was crucified and buried, scripture describes the empty tomb, and the multiple sightings of Jesus by the disciples up until the time that he ascended into heaven (Luke 24). He walked along the road to Emmaus with two disciples, Cleopas and probably Cleopas’ wife Mary (see also John 19:25). He then appeared in the middle of the group of disciples within an instant. He still possessed the defects caused by the crucifixion. He ate some broiled fish and some honeycomb (see Luke 24:42-43). He said to the disciples at this meeting with them, “Behold my hands and my feet, that it is I myself: handle me, and see; for a spirit hath not flesh and bones, as ye see me have.” (Luke 24:39) Not only did he have the same physical characteristics as his pre-resurrected body (same appearance, same gender etc), but he also had similar mental traits, such as self-awareness, memory of his pre-resurrection life, and emotions and connection to the people around him. However, he was not subject to the natural laws of physics, twice suddenly appearing in a closed room (John 20:19 and 26). Therefore it appears that rather than being a spirit housed in a body and furnished with a soul, we are instead an inseparable combination of body, soul and spirit – three unique but indivisible parts – but in different dimensions depending on which side of eternity we currently reside. 1 Thessalonians 5:23 confirms, rather than precludes, this view. Reviewing the scripture again, Paul wrote, “And the very God of peace sanctify you wholly; and I pray God your whole spirit and soul and body be preserved blameless unto the coming of our Lord Jesus Christ.” Paul chooses to emphasize all three components of our triune being equally in his prayers and wishes. If only our spirit was to pass into the celestial realm, then Paul wouldn’t have needed to delineate the three parts of our triune composition, but could have instead written “And the very God of peace sanctify you wholly; and I pray God your whole spirit be preserved blameless unto the coming of our Lord Jesus Christ”. By penning, “whole spirit and soul and body be preserved blameless”, Paul seems to treat all three parts as equally important to our future with Christ. It follows that if we believe that our heavenly body is an integral part with our spirit and soul on the celestial side of eternity, then it should follow that our spirit and our soul are part of, and dependent on, our earthly body on this side of eternity. 2. I suggest that the whole person is translated across from the earthly realm to the celestial, rather than just the spirit. Such suggestions are compatible with current scientific understanding. There is ample evidence of spiritual neural networks that complement the emotional and moral parts of our brain (this will be discussed further in a future section). String Theory provides a plausible explanation of other dimensions and worlds in parallel with our own which could very easily explain a spiritual dimension. String Theory is the theory that the very fabric of the cosmos is made up of tiny vibrating loops of energy, which physicists call “strings”. These strings are almost impossibly small. Physicist Brian Greene said that, “Each of these strings is unimaginably small. In fact, if an atom were enlarged to the size of the solar system, a string would only be as large as a tree!”  It’s the shape and vibrational pattern of each of these strings that gives subatomic particles their properties, which in turn combine to make up everything we see in the universe, including ourselves. In order for these strings to vibrate and move the way they are predicted to, String Theory postulates that there are actually 11 dimensions of space. In one of these dimensions, a string could become stretched out into a membrane, or a “brane” for short. I’ll let Brian Greene and colleagues explain it further. “BRIAN GREENE: The existence of giant membranes and extra dimensions would open up a startling new possibility, that our whole universe is living on a membrane, inside a much larger, higher dimensional space. It’s almost as if we were living inside … a loaf of bread? Our universe might be like a slice of bread, just one slice, in a much larger loaf that physicists sometimes call the “bulk.” And if these ideas are right, the bulk may have other slices, other universes, that are right next to ours, in effect, “parallel” universes. Not only would our universe be nothing special, but we could have a lot of neighbours. Some of them could resemble our universe, they might have matter and planets and, who knows, maybe even beings of a sort. Others certainly would be a lot stranger. They might be ruled by completely different laws of physics. Now, all of these other universes would exist within the extra dimensions of M-theory, dimensions that are all around us. Some even say they might be right next to us, less than a millimetre away. But if that’s true, why can’t I see them or touch them? BURT OVRUT: If you have a brane living in a higher dimensional space, and your particles, your atoms, cannot get off the brane, it’s like trying to reach out, but you can’t touch anything. It might as well be on the other end of the universe. Although it sounds preposterous, String Theory isn’t a fantasy of a few physicists who have watched too many sci-fi shows. String Theory is mathematically proven, and accepted by the majority of scientists. What if our physical reality was one brane, the supernatural realm was a different brane, and heaven was another? Angels could be all around us, in a different dimension of space that we cannot ordinarily perceive, but who have the ability to move into our dimension if required. When we die, it’s possible that our whole person is transformed into a different dimension – the supernatural or celestial brane. The physical body remains like a snakeskin left after the snake has shed it. My theory is only one of many possible theories. Ultimately, they all remain scientifically unprovable. While String Theory is well accepted by physicists all over the world, and the predictions of extra dimensions and branes are mathematically robust, my hypothesis that the supernatural realm is a dimension of space on a brane is conjecture, and would be impossible to test mathematically or scientifically. The concept of extra dimensions and branes is one way of explaining the Bible’s description that our spirit, soul and body remain together, but in a different realm to the physical reality that we currently experience. So if it’s possible that we can live as a whole person, spirit, soul and body, in a celestial dimension, what makes up our spirit, soul and body in the physical dimension? Biological science and neuroscience have uncovered many of the previously mysterious qualities that define us as human beings, although there is still much more to be uncovered. The body is our physical selves – our flesh and blood, sealed by our coating of skin. The body is so ultimately universal, I don’t want to waste space justifying the case for the normal. The obvious physical separation makes each person easy to delineate, although there are rare exceptions that challenge the division of body and soul/spirit. In May 2014, Faith and Hope Howie were born in Sydney (Australia) . They were born with two separate faces and two brains which merged into one brain stem. They had one body. While they were considered to be conjoined twins, in the strictest medical sense, they had a condition called disrosopus, resulting from the over-expression of a protein involved in the formation of the cranial structures . The condition is extremely rare, and most children with the condition are either stillborn, or don’t survive for more than 24 hours after birth. That Faith and Hope survived for 19 days is a miracle in itself. Strictly speaking, Faith and Hope were one baby that developed two brains, rather than being twins who failed to adequately separate. So did they have two souls or one? I don’t propose to answer this question here, but it will be worth pondering as we review the concept of the soul. The soul is traditionally considered to consist of the mind, will and emotions. In the earthly realm, there is overwhelming evidence that all the parts of the traditional soul are found in the human brain. The mind is considered to be “a person’s ability to think and reason; the intellect.”  As we will discuss in more detail later, dualism suggests that the mind is an ethereal force separate to the body. But modern neuroscience has accumulated decades of evidence to the contrary. Our stream of consciousness is linked to the function of our working memory [7, 8]. Working memory in turn is heavily dependent on the part of the brain called the pre-frontal cortex and on a neurotransmitter called dopamine . When dopamine-secreting nerve cells are damaged in the pre-frontal cortex, conditions involving disordered thought such as schizophrenia occur [9, 10]. Schizophrenia is best known for hallucinations, essentially hearing and/or seeing things that are not there. These symptoms are reversed by medications that enhance the dopamine response . Lesions of the frontal lobe can also result in the loss of abstract thinking . So it is fair to say that the function of the mind is dependent on the brain, specifically the pre-frontal cortex. If the function of the pre-frontal cortex is disrupted, either by damage to a group of cells, or by impairment of the signaling of those cells via disruption of the neurotransmitter dopamine, the patterns of thought change. These changes in the patterns of thought can be reversed if the impairment can be reversed. Therefore the mind is dependent on the brain. If the mind were independent of the brain, then the function of the mind would not be affected by damage or impairment to the physical brain. Our stream of thought is a function of our working memory utilizing a wider area of the brains cortex to better process important information. Baars [7, 12] noted that the conscious broadcast comes into working memory which then engages a wider area of the cerebral cortex necessary to most efficiently process the information signal. We perceive thought most commonly as either pictures or sounds in our head (“the inner monologue”), which corresponds to the slave systems of working memory. When you “see” an image in your mind, that’s the visuospatial sketchpad. When you listen to your inner monologue, that’s your phonological loop. When a song gets stuck in your head, that’s your phonological loop as well, but on repeat mode. So our mind, also called our stream of thought, is simply a projection of information from our working memory, broadcast to our cerebral cortex, and our consciousness, for extra processing power. It is dependent on our pre-frontal cortex. When the pre-frontal cortex is damaged, our mind can experience defective output, as is the case in thought disorders such as schizophrenia. These brain networks initially involve the basal ganglia deep in the brain along with the dopamine rewards system, which provide a flexible interaction between the person’s current situation and the memory of previous similar situations. Also important are the frontal lobes in general, and the pre-Supplementary Motor Area (pre-SMA) in particular, which have crucial roles in keeping actions focused and ‘on task’, or in “binding intention and action”. Parts of the pre-SMA are also active in voluntary selection between alternative tasks and in switching between the selections. An area of the anterior frontomedian cortex, near the pre-SMA, was activated in veto trials more than in trials on which participants made an action. This brain activity might have a key role in self-control . Damage to different areas of the frontal cortex and the other parts of the motor system can result in a number of different conditions, highlighting the role of the brain in our “voluntary” actions. For example, blockage of a small artery in the brain called the artery of Huebner may cause a stroke of the head of the Caudate Nucleus, resulting in the loss of voluntary movement, loss of motivation and loss of speech . Psychosis and ADHD are also disorders of action output of the brain, both of which improve with medications that improve the function of the frontal lobes of the brain. In children with ADHD, the change can be dramatic in a short space of time, and research across the last few decades proves the effect is more than placebo [18, 19]. The feelings of intention and the sense of agency (planning to do or being about to do something, and the sense that one’s action has indeed caused a particular external event) are so fundamental to human experience that it’s hard to consider the alternative: that our ‘free will’ is by-and-large an illusion. Our brain has already reviewed a number of alternative actions for any particular situation, and by the time that our consciousness becomes aware of the decision our brain has made, our motor area of our brain has already primed the neuromuscular circuit in preparation to perform the action. At best, our ‘free will’ is more like a veto function rather than a full conscious control of our behaviour . Multiple parts of our brain are involved in the planning and execution of our actions, especially the basal ganglia and the pre-SMA. Emotions are a difficult concept to define. Despite being studied as a concept for more than a century, the definition of what constitutes an emotion remains elusive. Some academics and researchers believe that the term is so ambiguous that it’s useless to science and should be discarded . I use a concept of emotions described by Dr Alan Watkins , which thinks of our emotional state as the sum total of the state of our different physiological systems, while feelings are the awareness, or the perception of our emotional state. However, I should stress that this is only one concept. Often the terms “emotion” and “feelings” are used interchangeably. That said, neurobiology has still mapped specific feelings/emotions to different parts of the brain. The amygdala is often considered the seat of our fears, the anterior insula is responsible for the feeling of disgust, and the orbitofrontal and anterior cingulate cortex are involved in a broad range of different emotions . Different moods have been linked to specific neurotransmitter systems in the physical brain. A predisposition to anxiety is often linked to variations in the genes for serotonin transport  while positive and negative affect (“joy / sadness”) are linked to the dopaminergic system . What is clear is that scientifically speaking, our emotions and the perception of them is dependent on our physical brain. Dualism’s view that the soul is an ethereal force separate to the body is redundant. The evidence from the scientific study of the brain makes it clear that every aspect of the traditional ‘soul’ – the mind, will and emotions – is housed in the brain. The scientific study of spirituality is on the leading edge of scientific progress. Whether a spiritual realm exists is not something that can be tested scientifically. I’ve discussed the Biblical view of the triune being hypothesis earlier in this essay, and suggested that a spiritual realm is at least scientifically plausible depending on your interpretation of String Theory. Ultimately, it remains a matter of faith. The existence of the spiritual realm may be debatable, but what’s well accepted is that human beings are fundamentally spiritual. Spiritual or mystical experiences are reported across all cultures , and throughout history, religions in various forms have spanned the globe, integral to civilizations and the forming of cultural identity. It’s therefore not surprising to find that the brain is a focal point for spiritual experience. Just as hunger, laughter, anger and many other characteristic human traits have their own unique pathways in the brain, so does the experience of the divine. Spirituality can be defined as “an individual’s experience of and relationship with a fundamental, nonmaterial aspect of the universe that may be referred to in many ways – God, Higher Power, the Force, Mystery and the Transcendent and forms the way by which an individual finds meaning and relates to life, the universe and everything.”  On consideration, spirituality encompasses both episodic mystical experiences and ongoing religious beliefs. Spiritual experiences involve multiple brain regions, and are mediated by a number of different neurotransmitters. In a study of Carmelite Nuns reliving a spiritual experience, Beauregard and Paquette observed activation of the right medial orbitofrontal cortex, the right medial prefrontal cortex, the right dorsal anterior cingulate cortex, the right middle temporal cortex and the left superior and inferior parietal lobes . There is also evidence that dopamine and serotonin are important neurotransmitters in the religious experience . More recent work on the function and connectivity of the medial orbitofrontal cortex shows all of these brain regions have strong connections to each other , and that together they function to encode and determine the predicted and real values of our choices. In particular, the medial orbitofrontal cortex helps to encode the anticipated rewards of incoming stimuli. The anticipated and actual values for the perceived stimuli are compared to give a prediction error, which serves as a teaching signal that can be used to improve future value assignments at the time of decision-making . This is intrinsically linked to the limbic rewards system via dopamine, which partially explains the increase in dopamine during intense religious experiences. Yet spiritual experiences are more than the rewards processing of incoming stimuli. Intense religious experiences have been reported during the aura of temporal lobe epilepsy, especially on the right side [27, 30]. It maybe that the right temporal lobe is largely responsible for the sensed presence of a higher being, and for the more intense religious experiences. Some scientists even went so far as to claim that complex weak magnetic stimulation of the right temporal cortex produced intense religious experiences , although this maybe more related to the suggestibility of the subjects rather than the temporal lobe “stimulation” . Therefore, while it is likely that the right temporal lobe is involved in experiences of spirituality, there is no lab-based repeatable evidence to confirm or delineate it. If spirituality is indeed solely based on the structure and function of the human brain, what are the implications for organized religion? To start with, it would mean that those with deficits in certain cognitive functions would experience spirituality to a lesser degree, or at least experience it to a different degree. In keeping with this hypothesis, Canadian researchers have shown that those people with mentalization deficits (reduction in the ability to understand the mental state of oneself and others which underlies overt behaviour), such as people on the Autism spectrum, are less likely to believe in a personal God . On the flipside, other people would be naturally wired to the divine: intuitive and sensitive to the experience of the spiritual. Moreover, even if a person is not naturally spiritual, one can train oneself to become more spiritual. The brain increases the neural connections within regions that are recurrently stimulated, which leads to expertise. For example, the mid-posterior hippocampus of London taxi drivers is much larger compared to London bus drivers. London taxi drivers are required to drive anywhere in London without maps, and so develop a much larger region of spatial knowledge than the bus drivers, who drive pre-determined routes . Similarly, novices who meditate show increased growth of neural networks involved in the regulation of emotion . It would follow that brain regions involved in the processing of spiritual experience would increase with regular spiritual practice, resulting in a greater sense of the presence of God and his joy. On the other hand, if acceptance of God is dependent on the function of certain networks within our brain, then how does that affect the foundational principle of salvation? Is it justice if one is condemned to eternal damnation when one has less capacity to believe in the first place? I cannot offer a definitive answer to that question. Maybe there is no definitive answer? Given that Jesus told Nicodemus, “For God sent not his Son into the world to condemn the world; but that the world through him might be saved” (John 3:17), and that Peter says about God, “The Lord is not slow in keeping his promise, as some understand slowness. Instead he is patient with you, not wanting anyone to perish, but everyone to come to repentance” (2 Peter 3:9), I trust that God will judge everyone fairly, but I’m not sure how the capacity of a person to accept salvation is judged. Perhaps that’s something that someone who’s theologically trained can comment on. In summary, while the Bible makes a distinction between body, soul and spirit, it maintains that they are inseparable parts of the same whole person. In the earthly realm, our spirit and the various aspects that traditionally constitute our soul are all enabled though various networks within our physical brain. The Bible also offers evidence that in the transition from the terrestrial to the celestial dimensions, the whole person is translocated and transformed, not just the spirit or soul. Like a reptile shedding its skin, our earthly body and brain remain after death but the person has been translocated into the celestial realm. Psychoneural or Cartesian dualism is the premise that matter and mind are distinct entities or substances; that the one can exist without the other; and that they may interact, but that neither can help explain the other. Dualism appears self-evident. It seems to explain behavior; and it accounts for the survival of the soul after death. Our mind and our body also appear separate. We have direct knowledge of our mental states, but we do not have direct knowledge of our brain states, so by simple logic, our mental states are not identical with our brain states. Dualism seems to be the obvious model of choice. However, we know that executive functions, emotions and even spiritual experiences can be induced or improved by stimulating the responsible brain networks (electrically in the lab, or with medications). And pathological changes to the brain, such as tumours, strokes, or brain injuries, all have the capacity to change the emotional or cognitive function of the sufferer, depending on the location of the lesion within the brain. If the mind were truly separate to the brain, then changes to the physical brain would not influence the mind or soul. Therefore, medicine and cognitive neuroscience have shown that dualism is false. 4. Dualism is inconsistent with cognitive ethology: “in particular primatology … comparative psychology and cognitive archaeology”. In short, dualism is dead. This damning evaluation of dualism poses significant ongoing problems for Dr Leaf and her teaching. 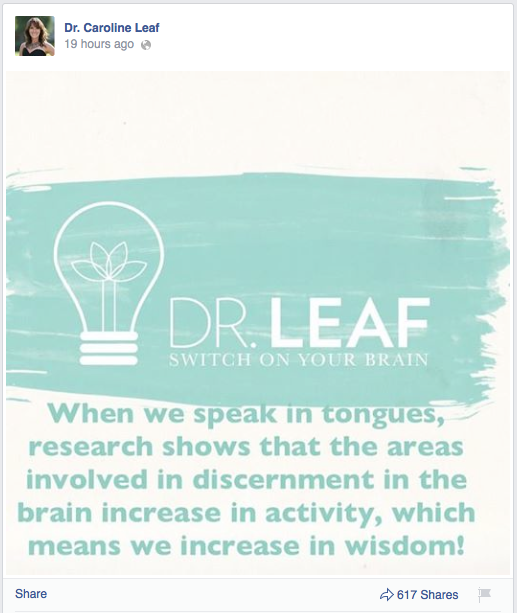 Her proposition that “Our spirit controls our soul/mind and our soul/mind controls our body” is not supported by either science or by scripture. This significantly weakens her standing as a biblical and scientific authority, and highlights an intellectual dissonance between science, scripture, and her published work. Unless Dr Leaf is prepared to review her position and change her teaching on the subject, the gap between her teaching and the accepted scientific position will only continue to widen, and her authority and respect will continue to weaken. For the Christian church, the Triune Being Hypothesis in its current form is now redundant. The review of the biblical evidence, and the current evidence from neuroscience, has disproven the triune being hypothesis insofar as there is no Biblical or scientific proof that the spirit, soul and body are separate entities. However, it’s reasonable to consider the spirit, soul and body as inseparable parts of the whole being, which are translocated together into the celestial realm upon death. At the very least, the position of the Christian church on the nature of the soul/spirit requires review, and topic should be brought back to the table to be appropriately debated. It’s clear that the old, generally accepted hypothesis of the separate, immaterial soul/spirit is untenable with current scientific evidence. In this essay, I have proposed one theory which is at least plausible with current scientific understanding. However, there are many other theories that may be just as valid, and warrant consideration. It’s my hope that with academic honesty and divine guidance, the truth of our triune nature can be further delineated. Greene, B. The Elegant Universe: Part 2. [Transcript] 2003 [cited 2013, November 4]; Available from: http://www.pbs.org/wgbh/nova/physics/elegant-universe.html – elegant-universe-string. Greene, B. The Elegant Universe: Part 3. [Transcript] 2003 [cited 2014, June 28]; Available from: http://www.pbs.org/wgbh/nova/physics/elegant-universe.html – elegant-universe-dimensions. Espay, A.J. Frontal Lobe Syndromes. Medscape eMedicine 2012 [cited 2014, July 1]; Available from: http://emedicine.medscape.com/article/1135866-clinical – showall. Postscript: There is a lot more to String Theory, and anyone interested in knowing more would be well served by reviewing the transcripts or watching the PBS series “The Elegant Universe”, hosted by Brian Greene.